The Hall of Presidents recently reopened at Disney World, and there’s a new big man in town. Over a year after the election, our current president Donald Trump finally exists in Audio-Animatronic form, with the real president himself voicing one of the three speaking parts in the show. This was a much longer closure than usual when a new president is elected. Trump’s unique unpopularity and divisiveness turned a standard theme park update into a tricky minefield for the company. Despite Disney’s promises that Trump would be included, as all new presidents are, conspiracy theories started popping up on Disney blogs and in theme park message boards about Disney trying to get out of adding Trump, or not giving him the customary speaking role for the incumbent president, or perhaps even shuttering the attraction all together. The much longer than usual refurbishment time seemed to support those ideas—in the past the hall has typically only closed for five or six months when adding a new president, instead of almost a full year. And considering how controversial Trump is—and, again, deeply unpopular, only a year into his term—it’s easy to understand why Disney wouldn’t want people to think about him during a visit to the Happiest Place on Earth. If Disney didn’t add Trump, though, it would have opened itself up to cries of bias and discrimination from conservatives and whoever still willingly recognizes themselves as members of Trump’s Republican party. Of course, Disney will still get those attacks, anyway. The company’s already a popular target of far right culture warriors, and regularly subject to the kind of sneering condescension that talk radio and Fox News has helped turn into a bedrock part of the conservative mindset, so it’s a total “damned if you do, damned if you don’t” situation. Not adding Trump or giving him a speaking role would rile up the vocal minority who are already highly mobilized—and, this is crucial, will still find something to attack Disney over no matter how much the company tries to appease them—but adding Trump will turn a classic Disney attraction into an absolute no-go zone for most people who visit Disney World. The Hall’s rep has long been as a place you can duck into for a nap and an air conditioned seat, so maybe Disney’s research shows nobody even really pays attention to the show, and thus it’s better to just shine a spotlight on the most hated president in history because the only people who would really care are the ones who would complain about him not getting a speaking role. If you haven’t seen the footage yet, here’s a video, from the YouTube channel of Disney blog WDW Magic. The best choice was probably to not give Trump a speaking role. Letting the current president give a speech in his real voice has only been a part of the show for just over half of its lifespan. For the first 22 years the speaking roles went to George Washington, Abraham Lincoln, Andrew Jackson, and three men who never became president—Benjamin Franklin, Stephen Douglas and Thomas Mifflin (don’t give us any of that “but Mifflin was president of the Continental Congress” guff, you nerd). That changed in 1993, when Disney added Bill Clinton and let the man speak for himself. (Jackson lost his speaking role and the three non-presidents got the ax in that update.) So before Trump, only the three previous presidents recorded a speech for the show. The five presidents who served during its first two decades did not. If Disney had returned to that policy, and only featured Trump in a non-speaking role, they’d still get heavily criticized by the MAGA types, but again: those people are always going to find something to complain about. 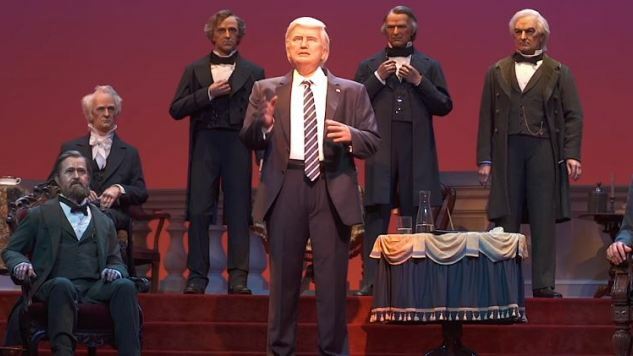 A silent Trump would have met the requirement to enshrine every president in robot form in this Hall, without letting his presence completely weigh down the entire show. One footnote about this whole thing: look closely at Trump’s Audio-Animatronic. (You can find photos at WDWMagic.com, or look at the YouTube screen capture above.) A lot of people think it bears a striking resemblance to Hillary Clinton. Is it possible they had a Clinton Audio-Animatronic ready to go and the long delay was in part due to them having to convert it into a likeness of Trump? That seems unlikely—Disney reuses Audio-Animatronics all the time, but for something like this, that will have to stand daily use for at least the next three years, surely they’d just make a new one that’s actually based on the person it’s supposed to represent. But it really doesn’t look that much like Trump, and there is a little bit of Hillary peeking out underneath that orange helmet of hair. If Clinton had won, she would have been a controversial addition to the Hall, too. (Newsflash: some people hate her.) But she didn’t build her campaign on a foundation of hate and exclusion. She didn’t turn her rallies into stream-of-consciousness shock jock stand-up routines. Trump is a uniquely divisive president, and that’s why Disney was left with no good options when it came to the Hall of Presidents. Garrett Martin edits Paste’s games and comedy sections and writes regularly about theme parks. He’s on Twitter @grmartin.